The set has both the Holly bunch on its own and the Holly on the mug with spoon. Get an early start and stitch in Summer to have goodies to sell. The two sets are now combined into one low price! 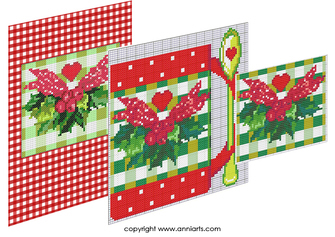 This design was adapted from the holly on the Xmas Fashion range and applied to the popular Birth Flower mug and spoon designs. The charts were designed for DMC floss, but are easily converted to other brands, because few colours are used. This design was adapted from the holly on the Xmas Fashion and Jolly Holly ranges and placed on gingham for a fresh Xmas look.